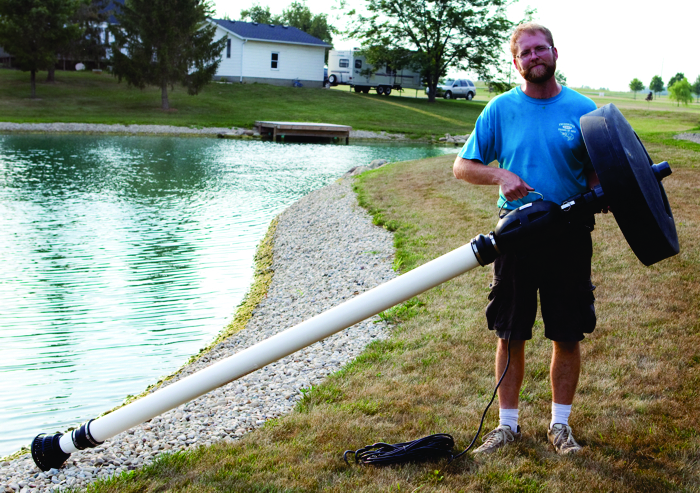 Draw-tube attachment kit for deep water aeration for ponds over 6 feet deep. 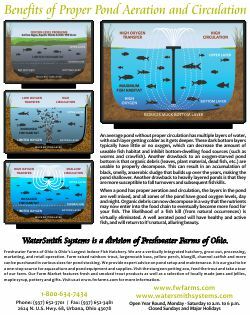 Helps combat silt build-up, nutrient accumulation, and fish kills. Attaches to WaterSmith PRO fountains. 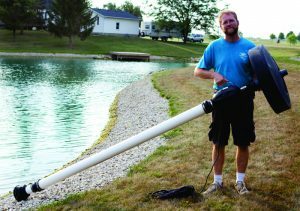 This Draw Tube kit provides the adapters necessary to add a 4″ thin wall PVC pipe to extend the intake depth in the pond. A PVC Pipe can be easily purchased and custom cut at any local hardware store. The length of the pipe should be cut so that it is 2′ from the bottom of the pond. The WaterSmith Draw Tube allows the fountain to circulate the bottom water and aerate the entire lake which combats silt build-up, nutrient accumulation, algae blooms and fish kills. The Drawtube kit is not compatible with the WaterSmith Wheel Kit (for 2HP fountains). An average pond without proper circulation has multiple layers of water, with each layer getting colder as it gets deeper. These dark bottom layers typically have little or no oxygen, which can decrease the amount of useable fish habitat and inhibit bottom-dwelling food sources (such as worms and crawfish). Another drawback to an oxygen-starved pond bottom is that organic debris (leaves, plant material, dead fish, etc.) are unable to properly decompose. This can result in an accumulation of black, smelly, anaerobic sludge that builds up over the years, making the pond shallower. Another drawback to heavily layered ponds is that they are more susceptible to fall turnovers and subsequent fish kills. When a pond has proper aeration and circulation, the layers in the pond are well mixed, and all zones of the pond have good oxygen levels, day and night. Organic debris can now decompose in a way that the nutrients may now enter into the food chain to eventually become more food for your fish. The likelihood of a fish kill (from natural occurrences) is virtually eliminated. A well aerated pond will have healthy and active fish, and will return to it’s natural, alluring beauty. 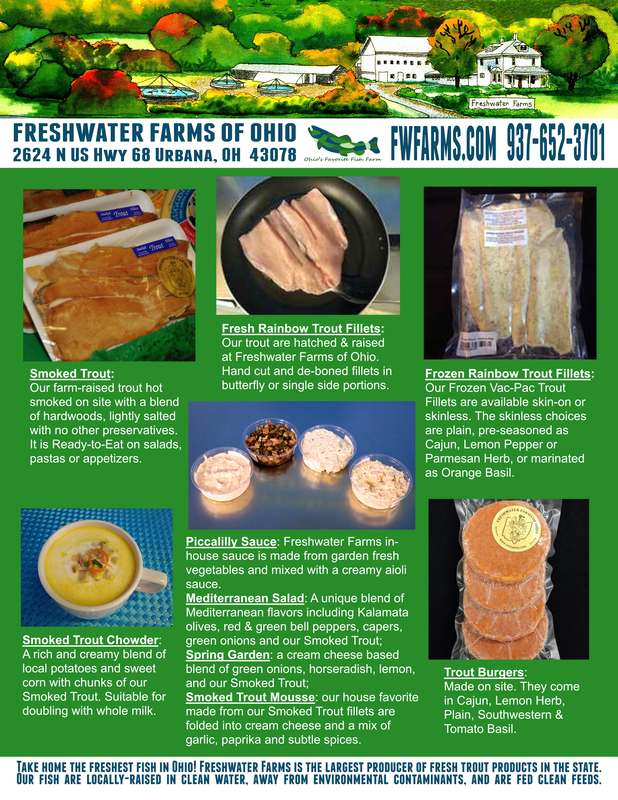 Get information on seasonal pond & water garden maintenance tips from Dr. Dave, updates on sales, special events, aquaculture news. We respect your privacy and will never share your email.